Person Responsible: D. Bromwich et al. • IPICS Expert Group (EG): Publication of synthesis papers on the 2000-year behavior of temperature and snow accumulation over Antarctica. • ISMASS EG: Organized a workshop on the impact of 1.5°C global warming on the Antarctic and Greenland ice sheets and the resulting contribution to sea level rise. A review paper was prepared. • GRAPE EG: Coordinating/leading efforts addressed to the new Scientific Research Programproposal RESOURCE (Radio Sciences Research on AntarctiC AtmospherE). 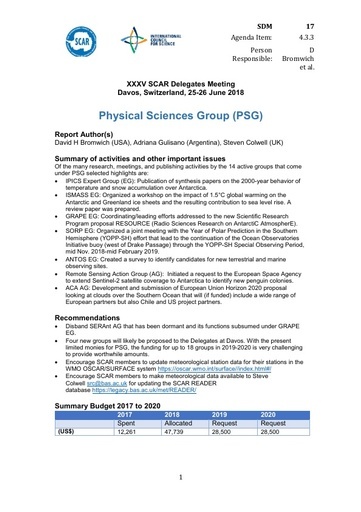 • SORP EG: Organized a joint meeting with the Year of Polar Prediction in the Southern Hemisphere (YOPP-SH) effort that lead to the continuation of the Ocean Observatories Initiative buoy (west of Drake Passage) through the YOPP-SH Special Observing Period, mid Nov. 2018-mid February 2019. • ANTOS EG: Created a survey to identify candidates for new terrestrial and marine observing sites. • Remote Sensing Action Group (AG): Initiated a request to the European Space Agency to extend Sentinel-2 satellite coverageto Antarctica to identify new penguin colonies. • ACA AG: Development and submission of European Union Horizon 2020 proposal looking at clouds over the Southern Ocean that will (if funded) include a wide range of European partners but also Chile and US project partners. • Disband SERAnt AG that has been dormant and its functions subsumed under GRAPE EG. • Four new groups will likely be proposed to the Delegates at Davos. With the present limited monies for PSG, the funding for up to 18 groups in 2019-2020 is very challenging to provide worthwhile amounts.